Just when you think you’ve seen all there is to see of cats on Instagram, this “12 cats Lady” Instagram page comes in and blows all those other feline social media accounts out of the water. 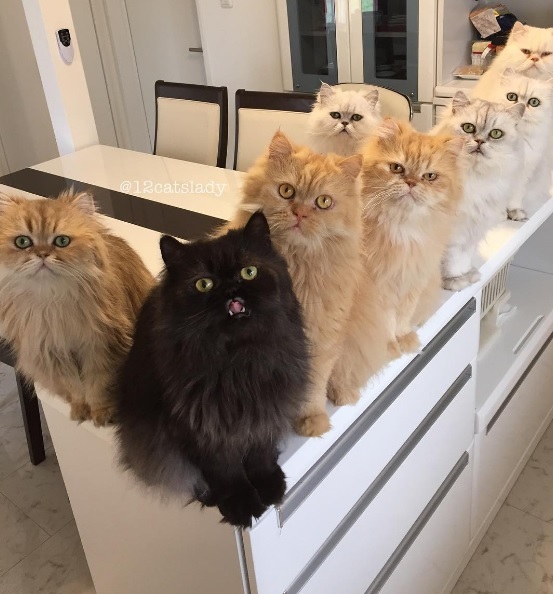 On second thought, pardon our cattiness (pun intended): In the interest of not pitting the wonderful cats of Instagram against one another, we’ll just say it’s definitely one of the most gratifying feeds to scroll through because it features 12 gorgeous chinchilla Persian cats that seem to be perfectly satisfied with doing EVERYTHING together. LOVE IT. This is even more evidence that being labeled as a cat lady isn’t nearly as bad as people make it out to be.